TORONTO, ONTARIO–(Marketwire - Dec. 15, 2011) - Lundin Mining Corporation (TSX:LUN)(OMX:LUMI) (“Lundin Mining” or the “Company”) is pleased to provide an interim report on exploration activities including an initial Inferred Resource for the Semblana Copper Deposit located adjacent to its 100% owned Neves-Corvo mine in southern Portugal. Initial Inferred Resource for the Semblana Copper Deposit of 6.58 million tonnes at a grade of 3.0% copper and 24 g/t silver is reported in accordance with the definitions in the Canadian National Instrument 43-101 (NI 43-101). Potential for width, strike and depth extensions of this initial copper-silver resource is considered excellent. Hole PSM46B-1, which is included in the initial resource reported herein, intercepted 20.5 metres of massive sulphides grading 6.1% Cu; including a high-grade interval of 5.0 metres of 16.0% Cu. A new zone of high-grade copper sulphides, which is not included in the initial resource reported herein, has been discovered approximately 300 metres to the south of the initial resource. Step-out hole PSR42, at a starting depth of approximately 930 metres, intercepted 14 metres of massive sulphides including a 5.0 metre interval grading 4.6% Cu. A second step-out hole, PSQ44, located approximately 80 metres to the northeast of PSR42, intercepted 8.4 metres grading 5.2% Cu at a starting depth of 920 metres. A new copper discovery has been made approximately 1.4 km south of Semblana and approximately 1.3 km southeast of the Zambujal copper-zinc orebody. Hole SCA26, intercepted a 32.5 metre thick section of strong stockwork-type copper sulphides grading 2.2% Cu including a higher grade interval of 11.0 metres grading 3.9% Cu. 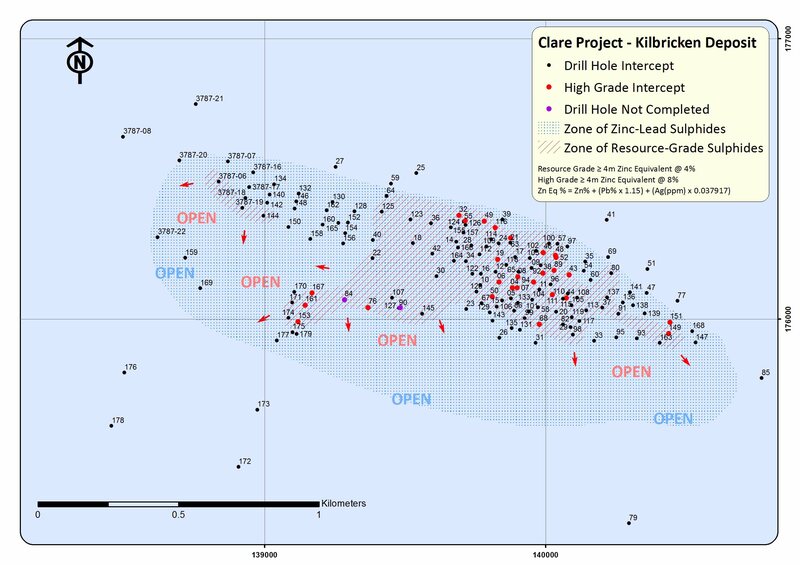 At the Clare Project in Ireland, a potential new zone of high-grade zinc-lead-silver mineralization, including 16.3 metres of 10.2% Zn+Pb, 22 g/t Ag in Hole 11-3679-161 at a starting depth of 601 metres, has been discovered approximately 750 metres west of the original Kilbricken discovery hole. Also in Ireland, a new grassroots zinc-lead discovery has been made in the Lakelands Project, located in County Leitrim, 80 km west of the Tara Mine. A total of 72,450 metres in 75 diamond drill holes, including 52 parent holes and 23 wedged holes, has now been completed at the Semblana Copper Deposit, extending the zone of copper-silver mineralization that was first discovered in September, 2010. Although additional resource expansion drilling is planned for 2012, an initial resource estimate has been prepared for Semblana to aid in mining concept and underground access optimization studies that are ongoing and are expected to be completed in early Q1/2012. A recently discovered, high-grade massive copper sulphide zone at the southern end of the deposit of 0.64 million tonnes grading 6.2% copper and 62 g/t silver, overlying a stockwork copper sulphide zone. This massive copper sulphide zone measures approximately 150 metres north to south and 100 metres east to west, and is open to the east and west for expansion. An extensive stockwork-type copper sulphide zone of 5.94 million tonnes grading 2.6% copper and 20 g/t silver. This zone occurs as one continuous zone measuring approximately 700 metres north to south and 250 metres east to west. Given the wide current spacing of drill holes, the zone appears to be open to the east and west. This initial copper resource estimate for Semblana is a progress report on an on-going exploration project that in mid-2010 first discovered thick but barren massive sulphides, followed later in 2010 by the discovery of copper stockwork-type sulphides, and more recently by the discovery of high-grade massive copper sulphides. The highest grade massive copper sulphide intercept drilled to date was just recently completed; Hole PSM46B-1 intercepted 20.5 metres of massive sulphides grading 6.1% Cu, 4.0% Zn, 1.2% Pb, 75 g/t Ag, 0.23 g/t Au including a high-grade interval of 5.0 metres of 16.0% Cu, 10.1% Zn, 1.7% Pb, 110 g/t Ag, 0.37 g/t Au. See attached table for the complete set of Semblana drill results: http://media3.marketwire.com/docs/lun-1215-table.pdf. 3D seismics clearly indicate a southerly extension of the Semblana Deposit. Follow-up drill-testing has confirmed the existence of the “Semblana South Extension”. Hole PSR42 intercepted a 5.0 metre thick interval of massive copper sulphides starting at a depth of 935 metres and grading 4.6% Cu, 3.1% Zn, 0.2% Pb, 65 g/t Ag, 1.47 g/t Au; it is visually similar to the massive copper sulphides that comprise the initial Semblana resource and so is believed to represent a continuation. Hole SCA26, located approximately 1.4 km south of Semblana and approximately 1.3 km southeast of the Zambujal copper-zinc orebody, intercepted a 32.5 metre thick section of strong stockwork copper sulphide mineralization starting at a depth of 751 metres and grading 2.2% Cu including a higher grade interval of 11.0 metres grading 3.9% Cu. This intercept is especially significant as it suggests the possible nearby presence of high-grade massive copper mineralization, also supported by the presence of two other mineralized intercepts contained in Holes SDA44-1 and PMB01 drilled in 1983 and 1994, respectively. An aggressive surface drill program is planned for 2012 to test several high-priority targets including the two mentioned above. Hole 11-3679-167, intercepted two separate high-grade zinc-lead sulphide intervals of 6.6 and 5.8 metres true thickness, composed of massive and semi-massive sphalerite, galena and pyrite, in addition to a 12.0 metre thick interval of high-grade copper sulphide mineralization that is rich in both chalcopyrite and bornite; assays are pending. Zinc-lead-silver sulphide mineralization has now been identified to extend over an area of 1800 metres by 600 metres at Kilbricken. The focus of the exploration drilling this year has been on broader step-out holes aimed at identifying a large new zone of high-grade zinc-lead-silver mineralization that is required to provide enough conceptual resource tonnage to warrant an intensive resource definition drilling program. The latest discovery, reported herein, provides strong evidence that such a large resource is present at Kilbricken. The presence of unusually thick and high-grade copper sulphides underlying the thick, high-grade zinc-lead-silver massive sulphide intervals intercepted in drillholes 11-3679-153, -161, and -167, is interpreted to be indicative of a robust and extensive mineralization system present at Kilbricken. Please see attached map: http://media3.marketwire.com/docs/lun-1215-kilbricken-map.jpg. A single scout hole, completed at the Lakelands Property in County Leitrim, Ireland, intercepted seven metres of zinc-rich sulphide mineralization within stratigraphically equivalent rocks to the Navan Beds that host the giant zinc-lead Navan Deposit at Boliden’s Tara Mine (initial reserves* of 69.9 million tonnes grading 10.1% zinc and 2.6% lead), located approximately 80 km to the southeast. The 7.0 metre mineralized interval contains a higher grade interval of 4.3 metres (true thickness) grading 3.94% Zn, 0.94% Pb (4.88% combined Zn+Pb) that includes narrower bedded intervals of higher grade zinc-lead sulphides. The mineralization is zinc-rich with pale sphalerite as the dominant sulphide mineral, displays a stratabound, bedding replacement nature and is hosted by a succession of calcareous sandstones and siltstones interbedded with muddy limestones stratigraphically interpreted as Navan Beds equivalent rocks. The sulphides were encountered directly beneath a prominent fault juxtaposing much younger rocks over the mineralized Navan Beds equivalent host rocks. The fault clearly terminates the upper portion of the mineralized beds and so the 7.0 metre interval is considered to be a smaller portion of a thicker nearby zone of mineralization. There has been no known significant previous drilling on the property. Applications for additional prospecting licenses have been accepted and follow-up drilling is underway. In Portugal, NQ sized drill core was logged, cut in half with a diamond saw and sampled by Company personnel at its facilities in Portugal at the Neves-Corvo mine. Prior to the 2011 campaign mineralized intervals are analyzed for a suite of elements including Zn, Cu, Pb and Sn at the Neves-Corvo laboratory using XRF methods. For the 2011 campaign mineralized intervals were analyzed for a multi-element suite using industry standard ICP methods at ALS Chemex Laboratory, Vancouver. In Ireland, NQ sized drill core was logged, cut in half with a diamond saw and sampled by Company personnel at its core facility in Ennis, County Clare. Mineralized intervals are analyzed for a multi-element suite at the laboratory using industry standard ICP methods. Values of Zn, Pb, Cu, Fe, As and Ag exceeding predetermined threshold values are re-analyzed by conventional assay methods. In both Portugal and Ireland a standardised protocol of quality control sample insertion using certified reference material, blanks and duplicates are used to monitor the quality of the sampling process and assay results. Jose Mario Castello Branco, EurGeol, General Manager of Exploration, Iberia, for Lundin Mining Exploration is a Qualified Person as defined by National Instrument 43-101 and has reviewed and approved the technical information contained in this release regarding the near-mine resource exploration drilling, including the Semblana delineation drilling, at the Neves Corvo mine in southern Portugal. Paul Gordon, PGeo (IGI), EurGeol (EFG), Manager, Geology (Ireland) for Lundin Mining Exploration is a Qualified Person as defined by National Instrument 43-101 and has reviewed and approved the technical information contained in this release regarding the Clare and Lakelands Projects in Ireland. The mineral resource estimates for the Semblana Project were prepared by Graham Greenway, Pr.Sci.Nat., Group Resource Geologist, Lundin Mining, in November 2011. Mr Greenway is a Qualified Person as defined by National Instrument 43-101 and has reviewed and approved the technical information contained in this release concerning the Semblana Mineral Resource. The Semblana Deposit occurs between 810 m and 900 m below surface. The geological model was created using drill core lithology and assay data with the mineralisation envelopes being defined using a 0.7% copper cut-off and a minimum drillhole intersection thickness of 4 m. Metal grades were interpolated into 3D blocks using Ordinary Kriging or Inverse Power Distance Weighting. The Mineral Resource was reported above a cut-off of 1.0% copper, as applied at the Neves-Corvo mine. The effective date of the Semblana resource estimate is 30 November 2011. The Company is also pleased to announce that the National Instrument 43-101 (NI 43-101) compliant Technical Report in support of the Tenke Phase II Expansion Study has been filed on SEDAR (www.sedar.com). Lundin Mining Corporation is a diversified Canadian base metals mining company with operations in Portugal, Sweden, Spain and Ireland, producing copper, zinc, lead and nickel. In addition, Lundin Mining holds a development project pipeline which includes expansion projects at the Neves‐Corvo mines along with its equity stake in the world class Tenke Fungurume copper/cobalt project in the Democratic Republic of Congo. Certain information contained in this press release, including any information as to our strategy, projects, plans or future financial or operating performance and other statements that express management’s expectations or estimates of future performance, constitute “forward-looking statements”. All statements, other than statements of historical fact, are forward-looking statements. Forward-looking statements are subject to a variety of risks and uncertainties which could cause actual events or results to differ from those reflected in the forward-looking statements, including, without limitation, risks and uncertainties relating to foreign currency fluctuations; risks inherent in mining including environmental hazards, industrial accidents, unusual or unexpected geological formations, ground control problems and flooding; risks associated with the estimation of mineral resources and reserves and the geology, grade and continuity of mineral deposits; the possibility that future exploration, development or mining results will not be consistent with the Company’s expectations; the potential for and effects of labour disputes or other unanticipated difficulties with or shortages of labour or interruptions in production; actual ore mined varying from estimates of grade, tonnage, dilution and metallurgical and other characteristics; the inherent uncertainty of production and cost estimates and the potential for unexpected costs and expenses, commodity price fluctuations; uncertain political and economic environments; changes in laws or policies, foreign taxation, delays or the inability to obtain necessary governmental permits; and other risks and uncertainties, including those described under Risk Factors Relating to the Company’s Business in the Company’s Annual Information Form and in each management discussion and analysis. Forward-looking information is in addition based on various assumptions including, without limitation, the expectations and beliefs of management, the assumed long term price of copper, nickel, lead and zinc; that the Company can access financing, appropriate equipment and sufficient labour and that the political environment where the Company operates will continue to support the development and operation of mining projects. Should one or more of these risks and uncertainties materialize, or should underlying assumptions prove incorrect, actual results may vary materially from those described in forward-looking statements. Accordingly, readers are advised not to place undue reliance on forward-looking statements.